The convertible market is continuing to grow and larger companies are beginning to offer much more affordable solutions since most of the adaptable machines cost a little bit too much. Maybe that’s the price of having a flexible, powerful and long-lasting notebook. 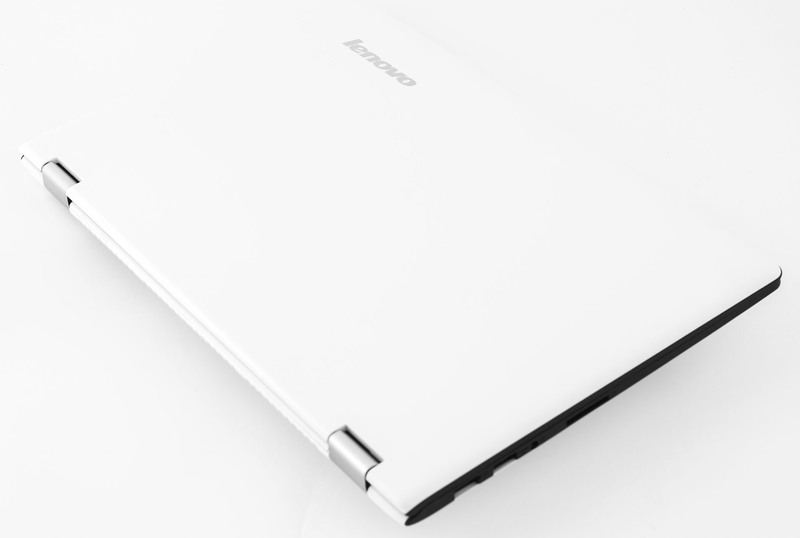 Nonetheless, Lenovo is here to offer a much more reasonably priced device that doesn’t lack the features of a normal Yoga device. 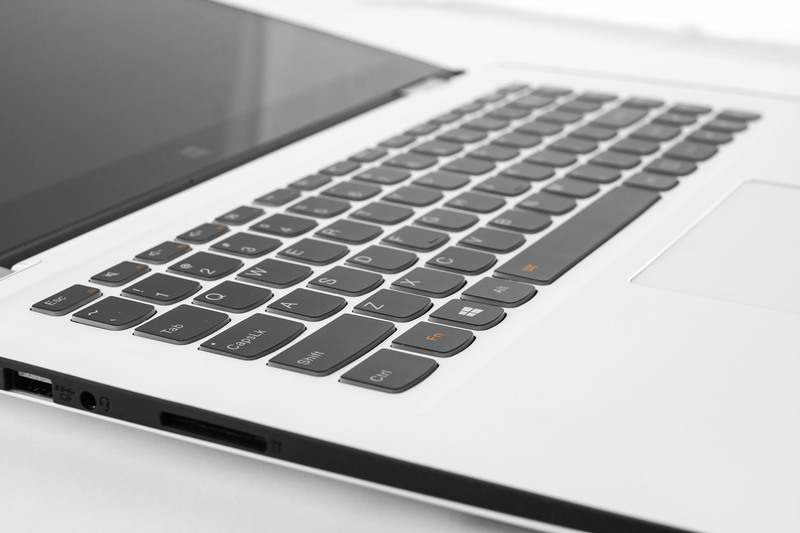 As usual, the 360-degree hinges, AccuType keyboard, relatively thin and light design, and a good screen are the order of the day. 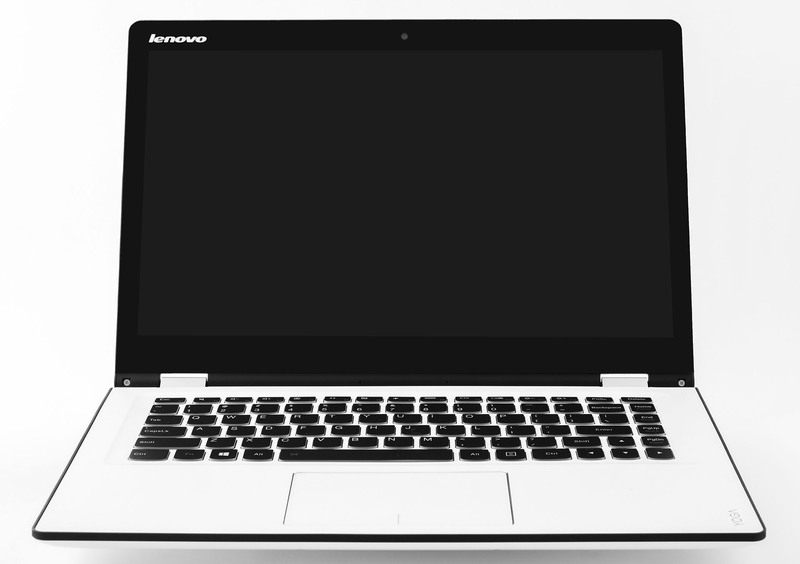 Still, how Lenovo managed to keep the costs to a minimum? Build quality, of course. Don’t get us wrong, though, the overall appearance and design are great for this price range but are nowhere near the top-tier Yoga notebooks. Keep on reading as the device has much more to offer. For the writing of this review, we used a pre-production sample that doesn’t come in a full retail package, so we can’t be sure what is included. Although, we sure the usual user manuals. DVD with drivers, AC charging cable and adapter are inside the box. 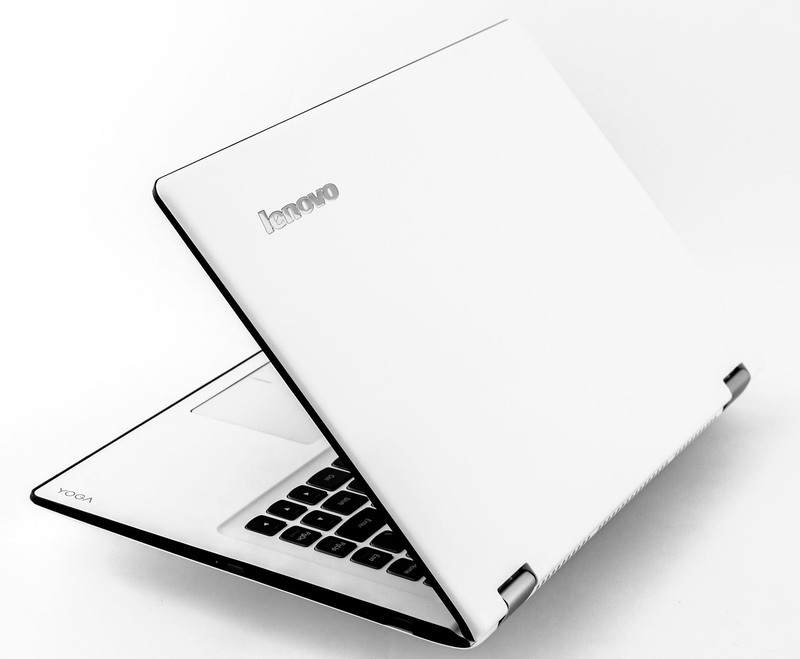 Lenovo kept the design language practically the same with small finishing touches in order to better the design of the new Yoga. We must say that these small changes do matter. Lenovo Yoga 3 14 is marginally bigger than its predecessor, which is quite understandable given the fact that it has a slightly bigger screen. However, the overall increase in the size and weight is about 10% making it unnoticeable. Furthermore, the thickness of the machine has also been increased, but we can’t quite put our finger on why is that. Starting with the lid, we are presented with soft-touch matte plastic that isn’t prone to leaving smudges (a big plus), but it really depends on the color you’ve chosen – the white variant is really hard to leave fingerprints on. In addition, the choice of material helps for a more secure grip. Small pressure bends the center of the lid, so be careful when placing it under heavy baggage when traveling. 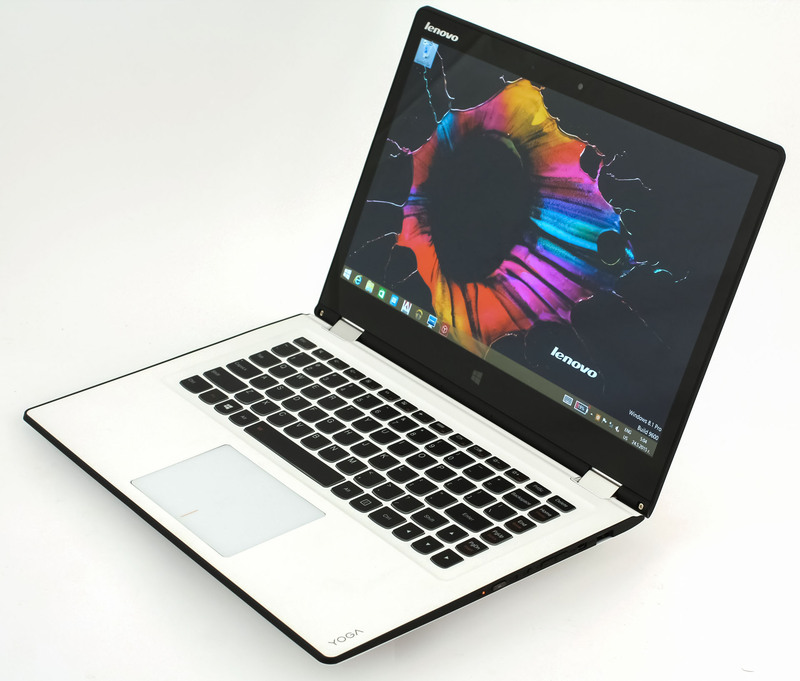 On the other side is the 14-inch Full HD panel with relatively slim bezels and rubber edges for protecting the screen when it’s used in different modes. Now is the time to mention the signature hinges that remain the same from last year’s model, meaning they are good, functional but feel a bit overtighten. Opening the notebook with one hand is a struggle and the screen wobbles when using the touch panel. 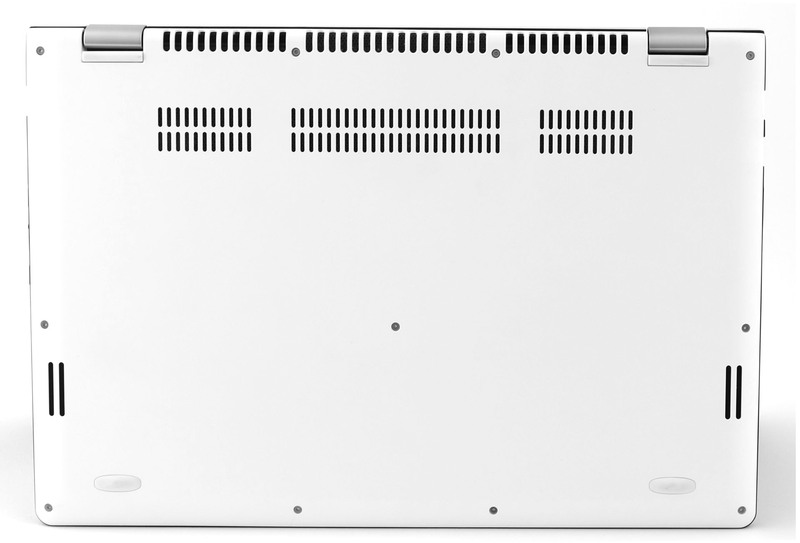 The bottom piece of the machine features the same matte soft-touch plastic attached to the chassis with a few screws. Removing it is quite easy, but for more information skip to “Disassembly and upgrade options” section. 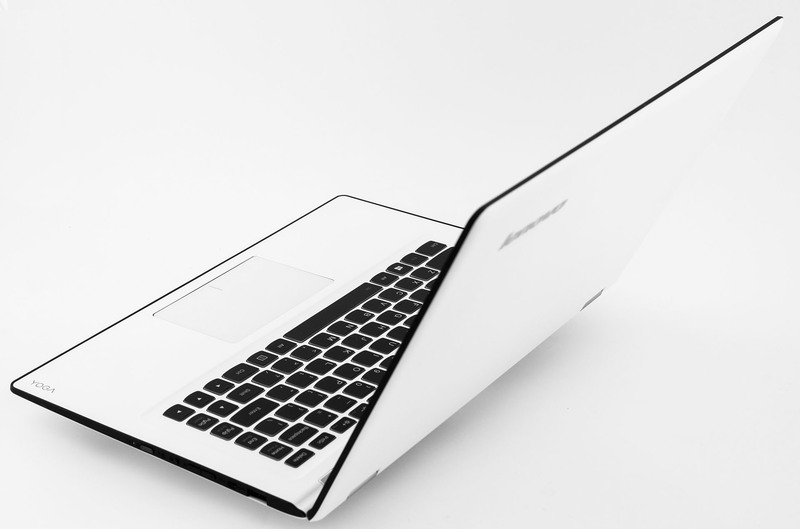 The bottom cover has the usual heat dispersion grills, but they seem to be more than usual for an ultrabook. We’ve got 3 big vents at the back and another 3 on the bottom that can be used with an external cooling pad. 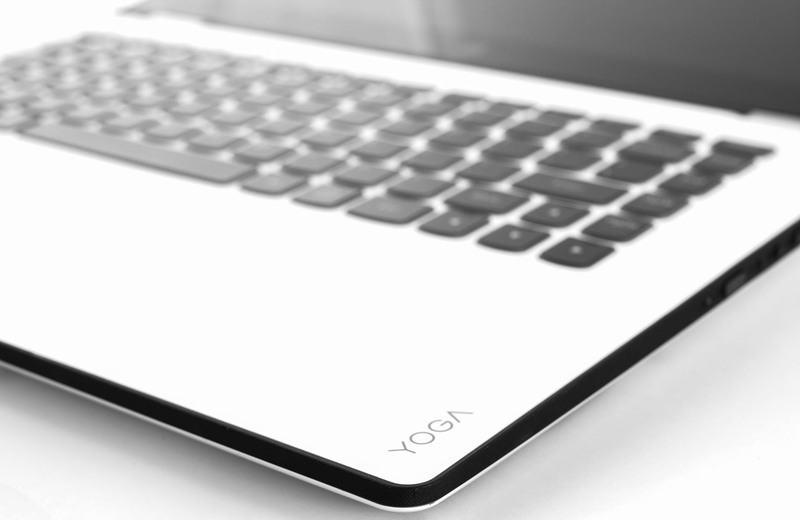 Going around the sides we began to like the Yoga 3 14 even more. 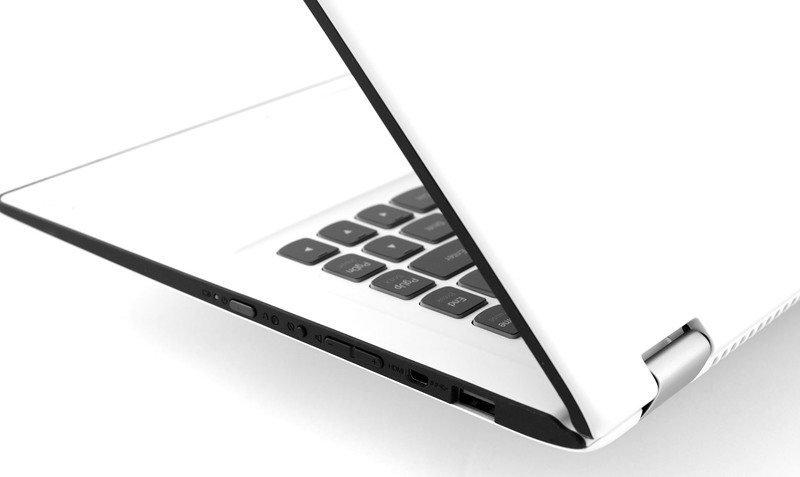 The main profile and the sides of the lid are covered in rubberized plastic intended for keeping the device firmly in place when using it in different modes. For example, when watching a movie in the so-called “Tent” mode, you can rest assured that the notebook will not slip and fall. Moreover, the usual ports are at hand – DC charging jack on the left (that can be used also as a USB port – really thoughtful isn’t it?) along with USB 3.0, 3.5 mm jack for headphones and SD card reader. The right side accommodates the other USB 3.0 port with mini DisplayPort. Also, you can see the power on button and the volume rocker. The reason for this placement is the tablet mode where you can still reach the most commonly used buttons. It is obvious that the build quality of the high-end 2-in-1 devices cannot be matched by the Lenovo Yoga 3 14, but its main selling point is the lower price tag while keeping the same features that Yoga devices offer. This model is slightly bigger than its predecessor Yoga 2 13, but with a marginally larger screen. 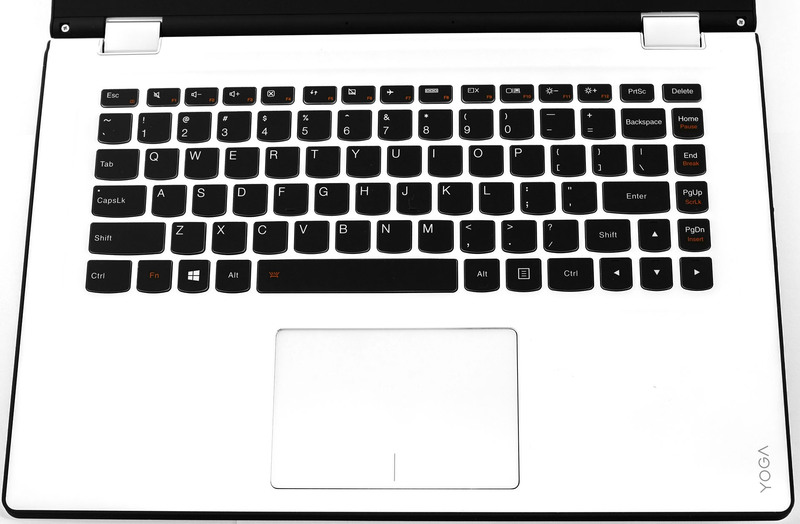 The weight hasn’t increased too much too (from 1560 g to 1746 g), but the small changes in the design from last year’s model are more than welcome – leaving smudges on the surface isn’t easy, improved overall grip due to the material used, the keyboard and touchpad are comfortable for normal use. Our overall opinion of the build quality, design and construction is positive and given the price range the room for improvement isn’t big. This is one of the main and most notable differences between the Yoga Pro version and the standard Yoga 3 14 – the screen quality. 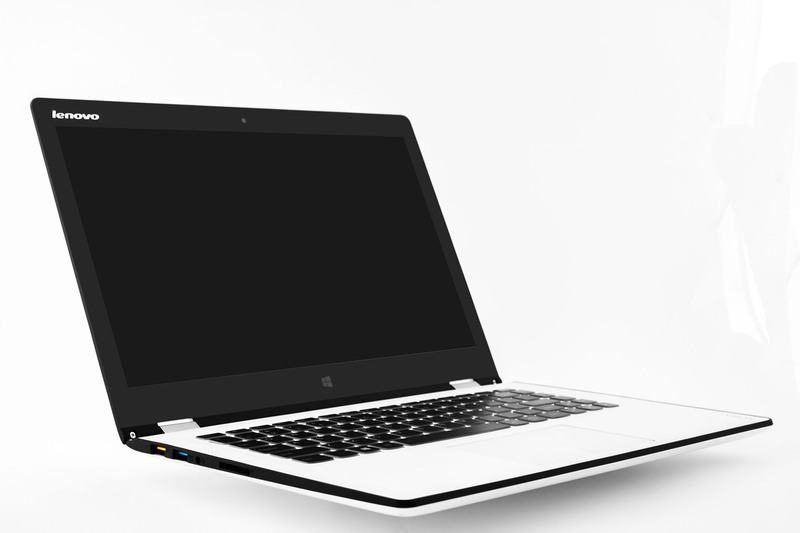 The one presented here is with 14-inch IPS panel, Full HD (1920×1080) resolution and a pixel density of 157 ppi. The pixel pitch is 0.1614 x 0.1614 and the screen can be considered “Retina” when viewed from a distance equal or greater than 56 cm. 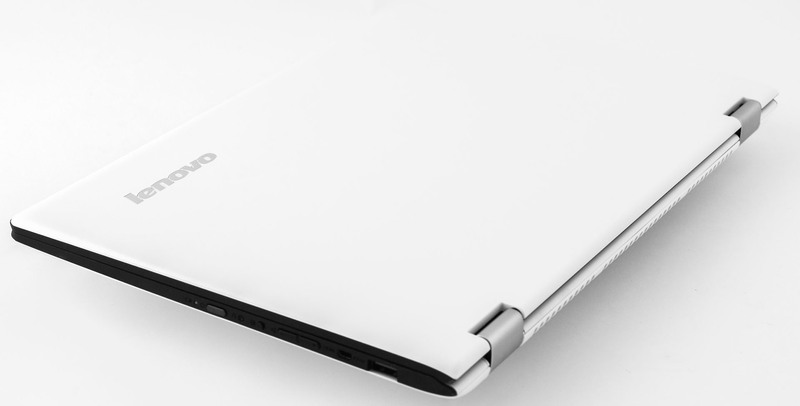 Lenovo Yoga 3 14 offers comfortable viewing angles from a 45-degree viewpoint. The maximum brightness we were able to record is 245 cd/m2 that can be enough for bright rooms, but the viewing experience is poor outdoors. Furthermore, the glossy finish won’t do any better. Also, the screen scored only 6% deviation and the average color temperature on the surface of the display is 6641K – really close to the optimal one of 6500K (D65). There isn’t a significant deviation from the tone response curve (gamma) and the recorded one aligns closely to the optimal one. To put things into perspective, we would like to give you a little introduction of the sRGB color gamut and the Adobe RGB. Starting with the CIE 1976 Uniform Chromacity Diagram that represents the visible specter of colors by the human eye giving you a better perception of the color gamut coverage and the color accuracy. Inside the black triangle you will see the standard color gamut (sRGB) that has been used by millions of people in HDTV and the Web. As for the Adobe RGB, this is used by professional cameras, monitors and etc. used for printing. Basically, colors inside the black triangle are used by everyone and this is the essential part of the color quality and color accuracy. Unfortunately, though, the Lenovo 3 14’s display covers just 60% of the sRGB color gamut leaving a wide specter of colors that can’t be reproduced. The color circled represent the standard color gamut reference while the white circles stand for the colors that the display was able to reproduce. Only colors with 100% or 50% saturation are displayed. As you can see, the lack of sRGB colors affects the overall color accuracy. We tuned the display at 140 cd/m2 (84% brightness) with its native color temperature. Our readings show 970:1 contrast ratio. Screen flickering occurs throughout the whole brightness levels, but the good news is that the light’s frequency is around 20 kHz meaning it will put less strain to your eyes. Higher frequency is desirable. We recorded the refresh time of the pixels from black to white and white to black for 10 to 90%. So we were able to measure Fall Time + Rise Time = 22.5 ms, which is more than three times the response time a TN panel would reach. But the TN panel cannot be compared to an IPS panel in terms of image quality. Lenovo Yoga 3 14’s display has its advantages and drawbacks. While Lenovo has delivered an IPS display for this price range with good viewing angles, touch-capacitive panel, we weren’t very happy with some of the readings. PWM light is detected across all brightness levels, but the emitted light’s frequency is 20 kHz and can be considered less harmful. Moreover, the panel is able to reproduce only 60% of the sRGB color gamut which strongly affects color accuracy as well. Colors with 100% that are missing will be replaced with other that are closer to them and this is more likely to happen in the red area of the specter. The panel is unfit for photo or video editing. The loudspeakers provided here can reproduce low and medium high sound frequencies. High pitch sounds sound relatively clear too. It’s hard to come across a device that can reproduce +/-6 dB sounds, so we are giving it a high score. 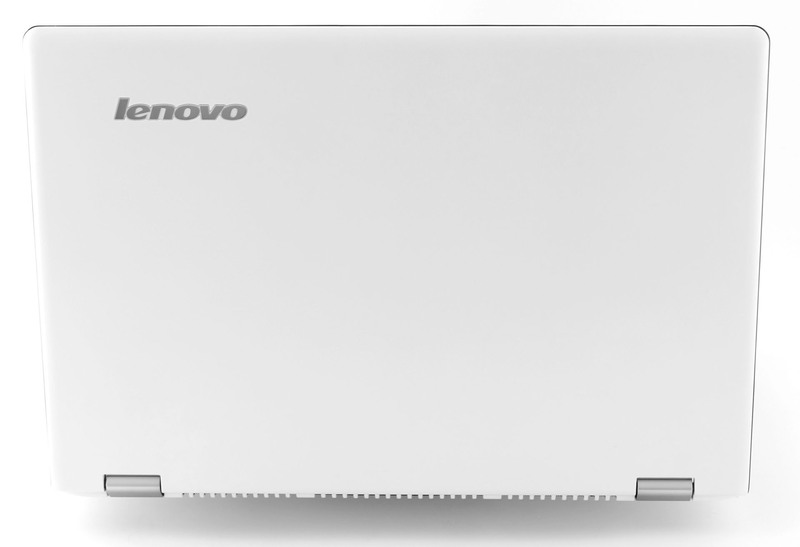 Lenovo has managed to cram up a pretty decent battery – 4-cell 45Wh. Some 15-inch and 17-inch notebooks don’t have such battery capacity so we can expect a good performance in this department. The only thing standing in the way is the power-hungry Full HD IPS panel, but let’s get to business as usual. We ran our web browsing, video playback and gaming tests sharing the same conditions as always – Wi-Fi turned on, Bluetooth off, screen brightness set to 120 cd/m2 and power saver turned on. Not bad for a budget convertible and even surpasses some high-end ultrabooks – 391 minutes (6 hours and 31 minutes). Similar result as usual – 376 minutes (6 hours and 16 minutes). Fritz is a chess benchmark which tests the computing capabilities of the CPU with various chess moves. The Intel Core i7-5500U managed to get 5.674 million moves per second. For comparison, one of the most powerful PCs, Deep(er) Blue, was able to squeeze out 200 million moves per second. In 1997 Deep(er) Blue even beat the famous Garry Kasparov with 3.5 to 2.5. Surely, this notebook is not made for gaming, but for comparison and evaluation reasons we ran some of the games. Before we begin, we would like to mention that this kind of test is only for overall system stability check rather than a real-life benchmark. It is quite unlikely for a normal user to reach 100% CPU and GPU load under normal circumstances. However, we start off with a 100% CPU stress test running for about an hour. Results here seem to be promising – 76 °C is the maximum temperature that the CPU reached being far from the maximum operating temperature of 105 °C. At first the CPU didn’t throttle, but after a while the frequency dropped to 800 MHz. For the record, the Core i7-5500U has a base clock of 2.4 GHz and a Turbo Boost frequency of 3.0 GHz for one active core and 2.9 GHz for two active cores. For the first few minutes the CPU kept a steady pace of 2.9GHz slowly declining to 800 MHz and thus temperatures dropped at 50-51 °C. You can see the temperature graph below. After an hour, we started the GPU stress test, but things didn’t change much. The CPU was still ticking at around 800 MHz and the temperature didn’t rise that much, only a few digits reaching as high as 55-56°C. You can see the temperature graph below. We also had the chance of measuring the temperatures on the surface and see how that affects the user experience. Just like its predecessor, the Lenovo Yoga 3 (14-inch) is available at a quite reasonable price for the features it offers. The build quality isn’t the best out there, but it definitely delivers more than expected, again for the given price. Hinges are a bit overtighten and yet again, the screen wobbles when using the touch panel and this might be our only major complaint in the design department. However, it’s good to consider the fact that the unit we have reviewed here is a testing sample, so the final unit might be lacking this issue. It’s rare to come across a device in this class that features IPS panel so this can be considered as a great plus, but don’t get your hopes too high as our tests show poor color gamut coverage leading to inaccurate color reproduction and furthermore – screen flickering across all brightness levels. 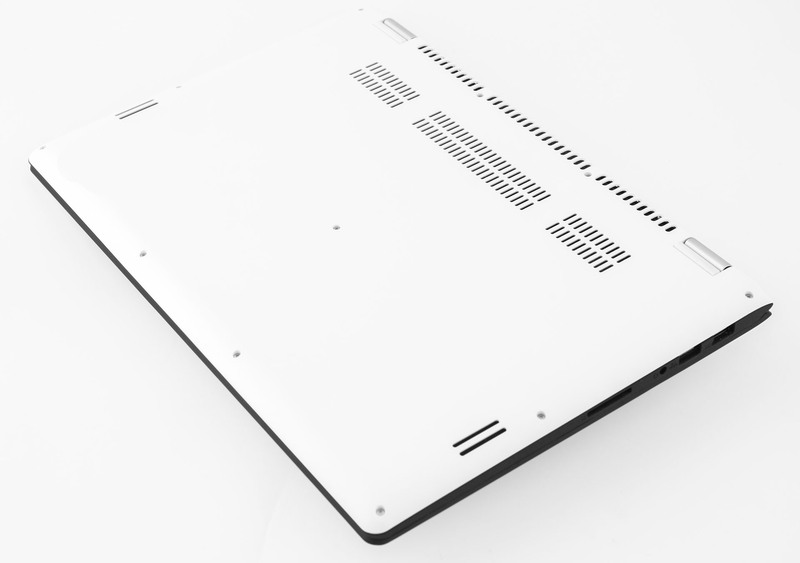 Spec-wise, the notebook brings more to the table than expected. The latest generation Core i7 Broadwell CPU is on board equipped with 256GB SSD and 8GB of RAM that should be more than enough for a daily driver and rarely matched performance at this point. Our tests also indicate that casual gaming is also possible as long as the game isn’t too demanding. Overall, the Lenovo Yoga 3 (14-inch) is one of the best affordable convertibles out there without compromise when it comes to the hardware itself. Is it possible to upgrade the 256 GB (7 mm) SDD to a higher capacity SDD ? How ? Please suggest suitable model / makes.